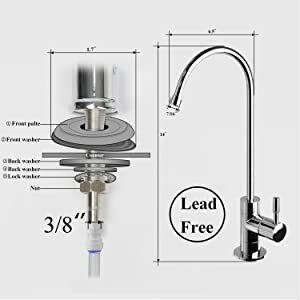 Designed for use in areas with water pressure lower than 40 PSI,Turn on & off automatically.with extra 4 pcs replacement filters, total 9 pieces filters in the box. HIGH EFFICIENT FILTRATION-5-Stage Under-Sink Reverse Osmosis Drinking Water Filtration System with NSF certificated Thin-film composite RO membrane filters down to 0.0001 micron,Reduce 99% contaminant ,including Heavy Metal, Arsenic, Lead ,Mercury ,Fluoride, Hardness,Cadmium,Chlorine,Taste,Odor,Asbestos, Lead, and more 1000+ contaminants. 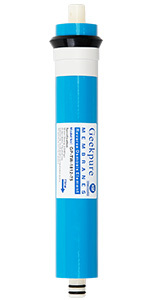 RESPONSABLE MANUFACTURER- ISO9001:2008 certificated Manufacturer ,also Member of Water Quality Association (WQA),Warranty-1year limited Product quality and service guarantee. 2.It Is Normal for Some Black Carbon Fines to Appear in The Water When Emptying the First 2 Tanks of Water. 3.The First 2 Tanks of Water Produced Should be Emptied and Not Used.Push the Tubing All the Way in and Use Teflon Tape During Installation. 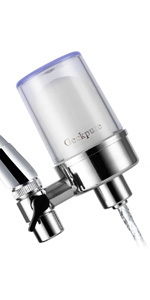 Designed for use in areas with water pressure lower than 40 PSI,Turn on & off automatically. 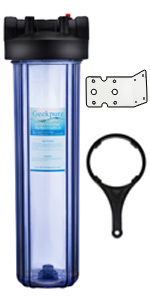 Premium ceramic disc operated, Lead-free ro drinking water dispensing faucets. 3/8 inch output. Faucet has a mounting range of ½”- 1 ½” for installation in a sink or countertop. Total 9 pieces filters in the box. 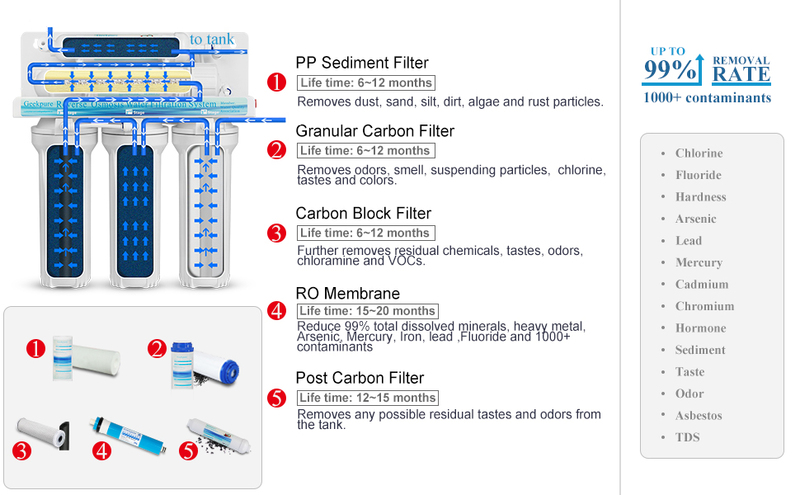 Post carbon filter x 2. 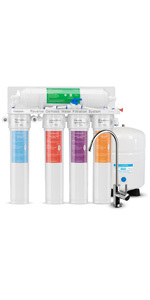 6-Stage Reverse Osmosis Drinking Water Filter System with Alkaline Mineral pH+ Remineralization Filter,adjust PH to 8.5 Whole house water filter housing,clear housing allows you to see when you need to change filters and everything else works as it should. 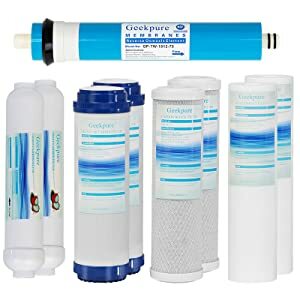 Geekpure Advanced 2-Stage Faucet Water Filter for Kitchen and Bathroom Removes Chlorine Taste & Odor, Sediment, Rust Particles - BPA-Free Geekpure Universal Compatible 75 GPD Reverse Osmosis Membrane Replacement-NSF certificated Removes 98% of Contaminants in Water. 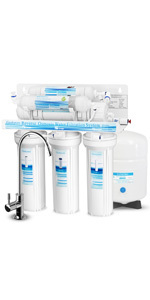 5-Stage RO System with Twist Filters. 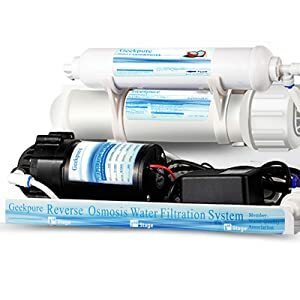 It's the best simplest installation reverse osmosis system. Changes filters in seconds, and no tools required. 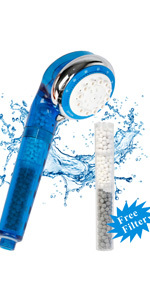 High-Flow Universal Handheld 4 Stage Showerhead Filter -Remove Hardness and Chlorine Add Vitamin C Dry Skin NO Longer Itchy-2 Filters Included-BPA free (Blue).